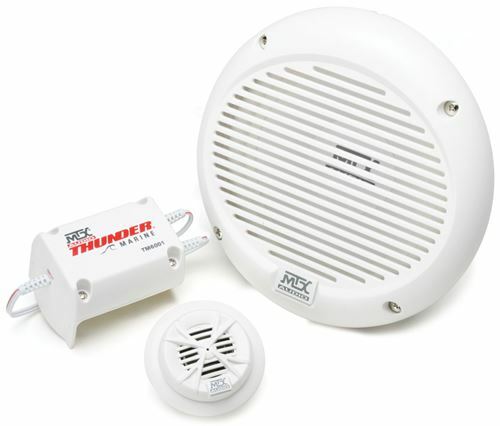 Thunder Marine is the number one choice for marine audio with a complete line of amplifiers, speakers, and subwoofers. Unlike other marine product that is just a white version of car stuff, Thunder Marine is designed for the harshest marine environment. MTX engineers spent two years developing Thunder Marine to be a bulletproof. Integrated technologies include water resistant polypropylene woofers, teteron tweeters, a sealed ABS basket that prohibits water from getting into the motor structure, silicone insulated tinsel leads, and an ASA grille that is durable and UV resistant. Even with all of this advanced technology, thunder marine is still pure, legendary MTX. The TM6001OE is a 6.5" component speaker that includes a woofer, separate tweeter, and crossover. Component speakers are the best way to get full range sound to any location. The tweeter which delivers all of the high frequency sound including vocals can be mounted closer to the listener's ear ensuring proper imaging and great sound. The speakers have a 4Ω voice coil and are capable of handling up to 75-watts RMS power, ideally matched to the WET75.2 or WET75.4 marine amplifiers.